Santa Claus Is Coming to Town, July 19! Galveston is the Winter Wonder Island of Texas, and this season the island will offer visitors more than 1,000 magical holiday events! This summer, be sure to visit with Santa at a variety of events throughout the island. You’ll also have the chance to win some cool prizes by participating in Galveston’s Photo Contest. It’s Christmas Around the World as Santa travels from the North Pacific to South Pacific in the Aquarium Pyramid to Asia, Africa and the Americas in the Rainforest Pyramid and Palm Beach. Free Santa Hats are available as supplies last. 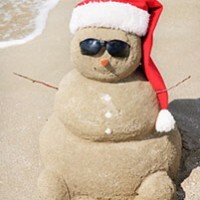 Get your picture and go to Galveston.com/holiday to register for prizes! Stop by the Garden Lobby with the kids and enjoy some free Arts & Crafts activities from 2 – 4 p.m. as well. 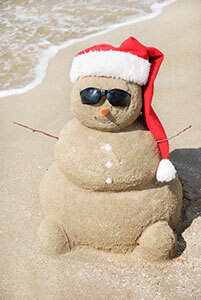 A few slots remain, so register now to participate in our Snowman Sand Castle Competition on July 19 at Palm Beach. Participants will receive a Snowman Sand Castle Building Kit, then will have until 3:45 p.m. to build their very best snowman. Judging will begin at 3:45 p.m. and winner will be announced at 4 p.m. The winner will receive a Penguin Encounter Certificate for 4 people and tickets to all Moody Gardens Attractions (Including ICE LAND Ice Sculptures, Festival of Lights and Arctic Ice Slide) for 4 people. 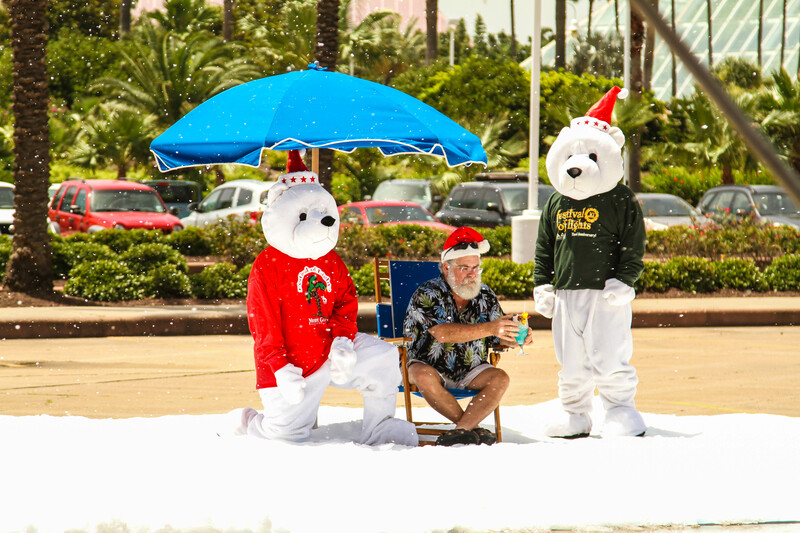 Celebrate Christmas in July by connecting with us through Social Media and you’ll get the chance to win a Holiday Four-Pack to Moody Gardens, which includes tickets to all attractions as well as the ICE LAND Ice Sculptures opening November 15, 2014. TO PARTICIPATE: Visit our Facebook, Twitter or Instagram each week in July and participate in our Christmas in July trivia questions by using the handle @moodygardens and the hashtag #ChristmasInJuly. If you answer correctly you will be entered into our weekly drawing. Remember to use our handle and hashtag! This promotion is in no way sponsored, endorsed or administered by, or associated with, Facebook, Inc., Twitter, Inc. or Instagram, Inc. Must be 18 years or older to win. ICE LAND Ice Sculptures makes its debut November 15 – January 4 for the first time in South Texas. Marvel at the artistry of the internationally acclaimed VGA Ice Carving Team from Harbin, China, as they bring their extraordinary talent to sculpt 900 tons of ice into a vast and amazing display of towering ice sculptures held at a cool and constant 9 degrees as Galveston makes its transformation into the Winter Wonder Island. There is more than ever for your family to enjoy! Be among the first to experience the ICE LAND Ice Sculptures attraction, Festival of Lights, Arctic Ice Slide, Ice Skating, holiday films and much more! Posted on July 17, 2014 Author Moody GardensCategories Events, Festival of Lights, GeneralTags Arctic Slide, Christmas, Christmas Events, Christmas In July, Family Activities, family fun, Festival of Lights, Galveston, galveston island, Holiday Season, ICE LAND, Ice Sculptures, Ice Skating, Palm Beach, Summer, Summer Activities, Wate parksLeave a comment on Santa Claus Is Coming to Town, July 19!